What a week! It’s the second week of my six week class … and these newbies have been prolific! You should see the work I have on the shelves — just waiting to dry out and get into the kiln. We’ve been working on bowls — first pinch pots and then coiled bowls. They look fantastic. Student bowls — small ones almost ready for the kiln! 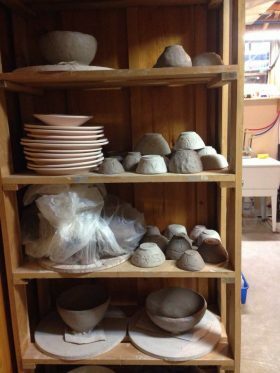 Every student made two pinch pot bowls — so there’s 24 at various stages of drying that will be ready for the kiln by Saturday night. There’s also mountains of Christmas ornaments (will post pics when they are done). I have my own mountain of them to get in and glazed before next Thursday — the Southampton Art Gallery has a Christmas Pop up show from November 22 to December 24. I don’t know how I’ve managed it, but I’ll be in the usual rush! Been feeling a little stymied in my own production, so I started to do some teapots for fun … will post pics when I have them together. I can feel a need for color coming on! Hoping to try something different … they won’t be ready for Christmas (probably) so there’s no pressure to get them done. I’m trying the PSH brown clay, see if that gets me revved up. If not, it’s back to porcelain! Anway, back to pots! My schedule is up for the new year, but I may find somewhere in there to add a beginners wheel class. Hoping to pick up another wheel next month. 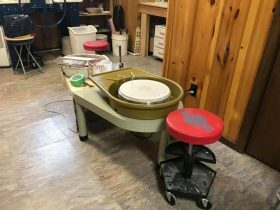 I LOVE the Frema wheel from Pottery Supply House. I don’t know why I’ve never noticed it before. Soooo stable and sturdy. I think I found a new love …. sorry Shimpo. New wheel — will be used for porcelain until next year! It’s going to be interesting finding space for another wheel … good thing Gary’s making more space in the carport! Hope you’re having a great day. Mine has been filled with the laughter of new potters. What could be better? I am so jealous! Wish i was there to show the newbies what not to do!